There are many ways to achieve Frequency Modulation (FM) in ACE. The "Cross" knob adds "cross modulation" which is equivalent to analog FM. This knob can be a bit confusing because if you turn up the knob after initializing a patch you'll hear no effect. This is because the knob controls how much VCO1 modulates VCO2 and when you initialize a preset the "VCO Mix" knob is set so you only hear Oscillator 1. So always remember to to turn op the "VCO Mix" knob so you can hear the effects of the "Cross" knob setting. Of course things get much more interesting when you modulate "Cross". 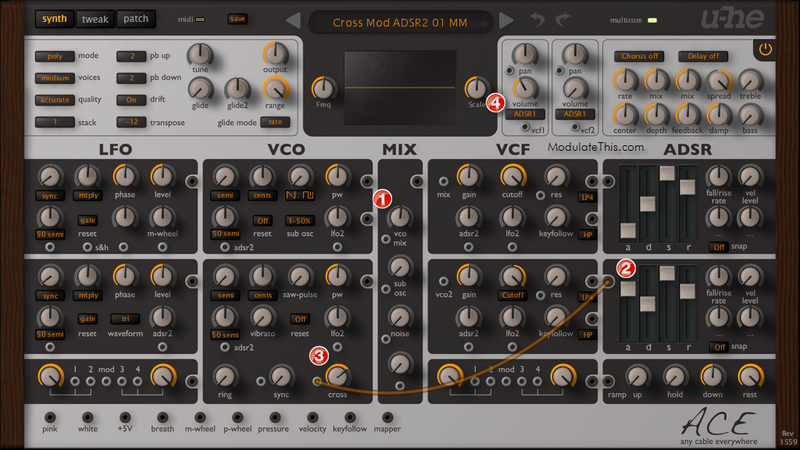 In this example let’s use modulate "Cross" with the "adsr 2" envelope. Tweak "adsr 2" to give it a log attack and release. Add more time to the release stage of "adsr 1" which will allow you to hear the FM modulation change after key release. Patch output of "adsr 2" to the "Cross" input. Turn up the gain of "Cross". Experiment with tweaking #3 "cross", #1 "vco mix" to adjust to your taste. Also try turning "vco mix" all the way up so you only hear "vco2" then change the pitch of "vco1" to hear how adjusting "vco 1"'s frequency changes the harmonics. Here is an audio example of what this preset sounds like https://soundcloud.com/markmosher/u-he-ace-cross-modulation-adsr2.